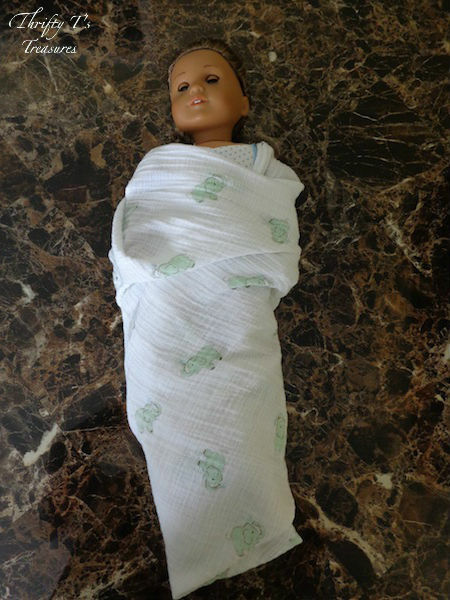 I learned how to swaddle a baby from the fabulous nursing staff at the hospital where our son was born. Swaddling is a wonderful tool to have in your new mommy (or daddy) tool belt and you’ll feel so fulfilled once you’ve mastered this task. 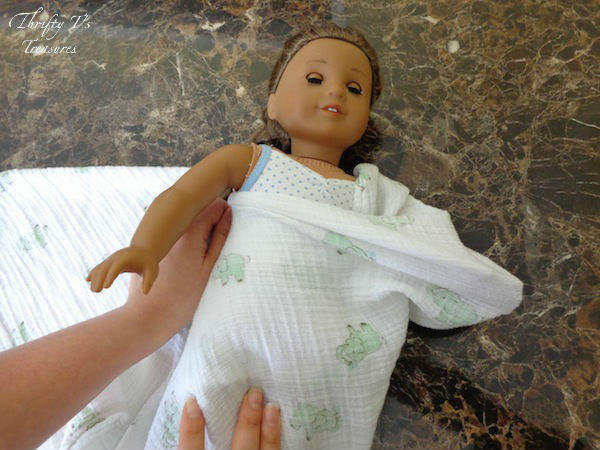 Learning how to swaddle a baby can be intimidating and it takes a bit of practice, but I promise if I can learn how to do it you can too. 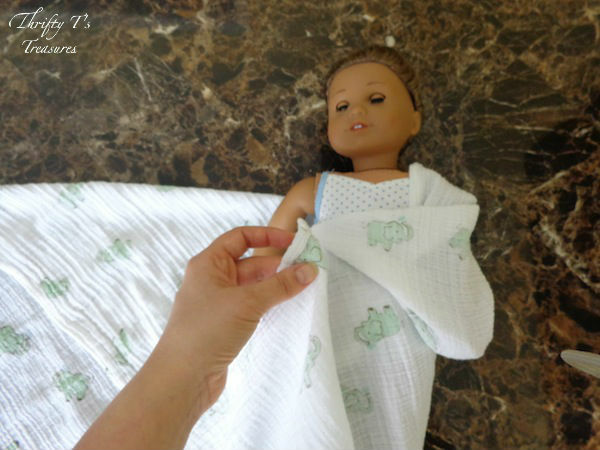 Follow these step-by-step directions and you’ll have your baby swaddled in no time at all! Your baby has been nice and snug inside your tummy for the last nine months. 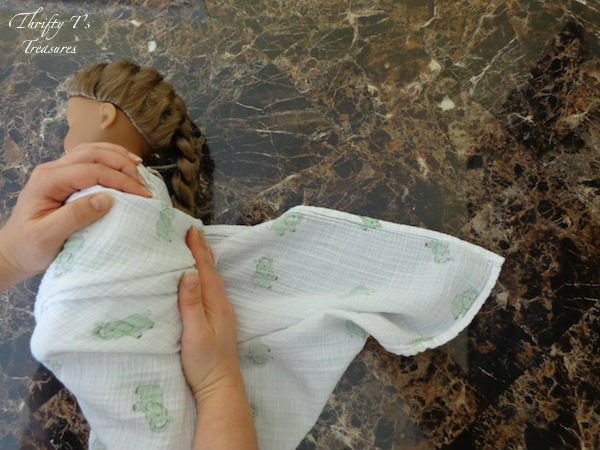 When she entered the world it felt like a really big place and swaddling gives her a sense of security. It makes her feel safe and imitates being back inside your belly. 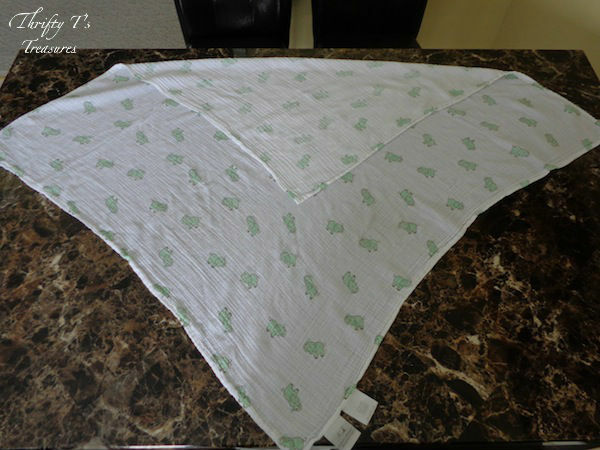 There are tons of swaddle blankets but, hands down, the Aden & Anais swaddle blankets are my favorite. 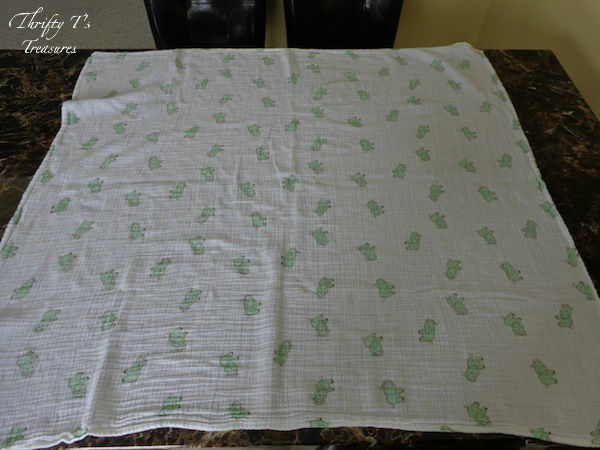 I also love that they’re made of muslin (a light cotton fabric). My son, Dalton, likes to sleep with his hands around his face and with these muslin blankets I never once worried about him not being able to breath when he was swaddled. Ok, let’s get started…shall we? 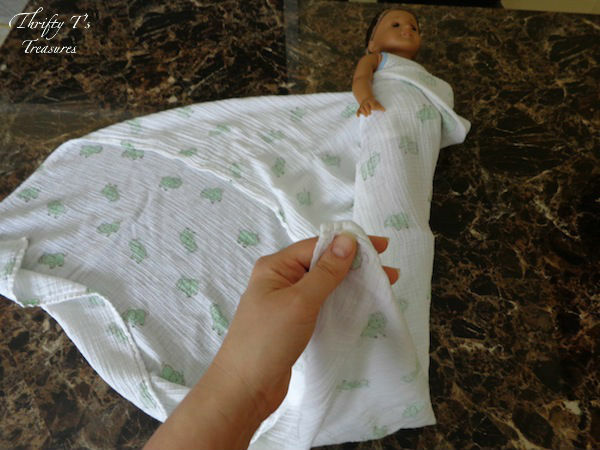 Fold the top part of your blanket down until it’s nearly in the shape of a triangle. 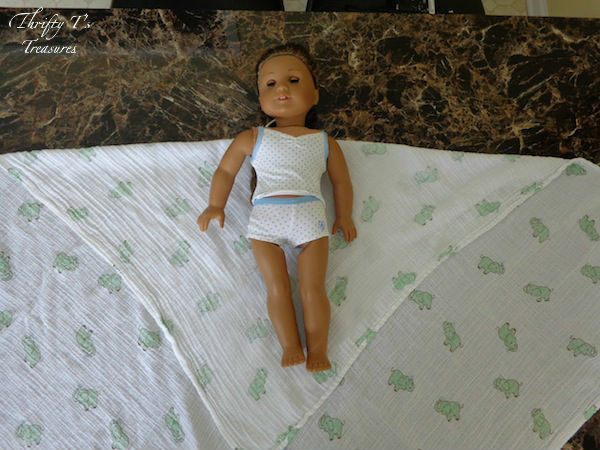 Place your baby at the top, middle portion of your blanket. For her safety, and to prevent smothering when she sleeps, you do not want the blanket to be above her shoulders! 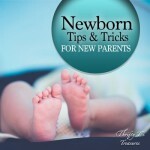 Once your baby’s hand and arm are snug under the top layer, pull both layers across her body. 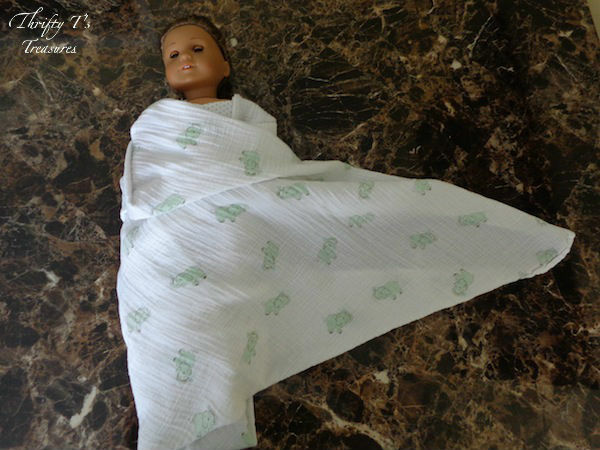 Roll your baby onto her side and tuck the blanket you just pulled across her body underneath her. 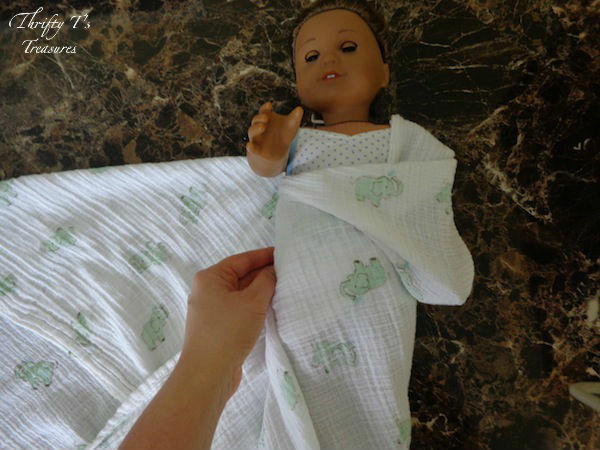 Tuck your baby’s free arm underneath the top layer of the blanket (just like you did with her other arm). Pull the blanket across her body. Wrap the blanket around her body. You can do this by either rolling her onto her side (as shown in the picture) or by picking her up and wrapping the blanket around her. And voila! 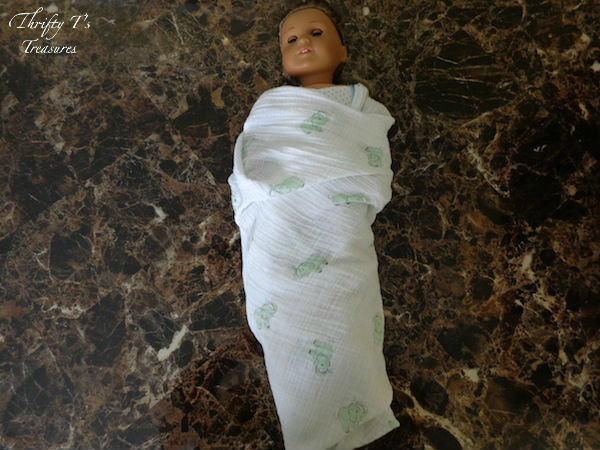 You’ve just swaddled your baby! Way to go momma (or daddy)!